A wallpaper pasted ceiling can have a chic set of visual effects. This approach to finishing will help you to divide the room into separate zones and will help to create comfort in the home. This is especially true in a one-room apartment, in which at the same time a room can be a study, a bedroom, a dining room, and a living room. The wallpaper on the ceiling is a great solution, first of all, in terms of aesthetics. 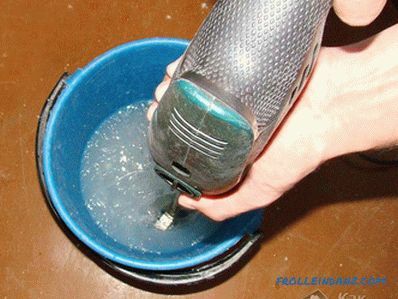 With regard to labor costs, there is also a clear advantage, unlike other methods of finishing. It is also worth noting that with such tasks you will be able to cope on your own. Although there are some nuances due to the horizontal arrangement of the surface to be glued when sticking wallpaper, there are no significant differences in the technological process. 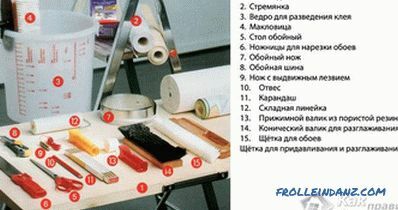 If you do not have much experience in pasting wallpaper, it is better to ask someone for help. It is worth noting that the wallpaper because of the current force of attraction are more likely to fall behind the ceiling than from the walls. Because of this, glue the entire strip is necessary immediately. 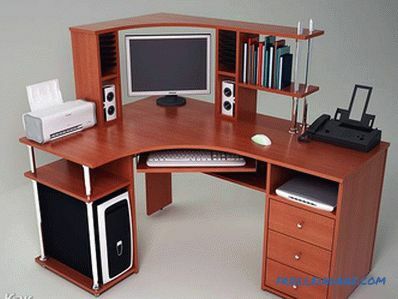 To achieve success it is necessary to pay attention to the preparatory work. It is worth noting that the dense materials used for wall cladding are not suitable for the ceiling. This is due to the fact that the weight of materials plays an important role here. Because of this, choose wallpaper that will be lighter, taking into account the characteristics of the surface. To avoid mistakes, pay special attention to the markings on the rolls with wallpaper. The weight of wallpaper designed for facing the ceiling cannot exceed 110 g / m, while lightweight walls weigh from 110 to 140 g / m 2 . The weight of the remaining wallpaper, which is based on the paper, exceeds these figures. When choosing wallpaper, more often than not, everything depends on financial possibilities , condition of the ceiling and the taste of the owner of the living space. Reading the instructions, you can understand which ones will be most suitable for you. 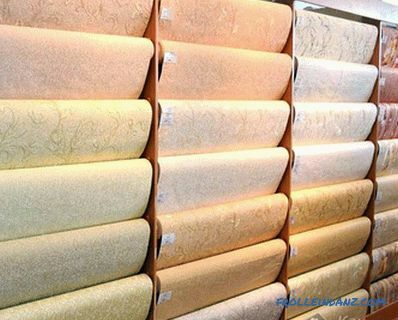 The most popular among consumers are liquid, vinyl and non-woven wallpaper materials. If your aesthetic taste requires more original ideas, then you can choose the finish of the wallpaper with embossed or patterned. But here you should think carefully about how you have to combine its elements between the canvases. It is also worth noting that if the room that is to be covered with wallpaper has a non-standard and complex shape, then it is better to choose wallpaper for painting. So, you can easily cope with pasting and subsequent painting of the ceiling. Also, do not flatter yourself with wallpaper with the edge, because in its absence they are easier to dock closely. 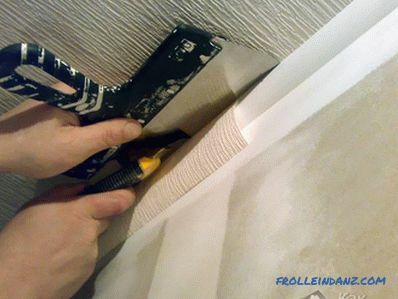 Before the wallpaper glueing process is started, you need to thoroughly prepare the room. So, the pre-wall of the house should shrink. If this condition is not met, then the wallpaper may tear or at least winch. If the house in which you live is not even a year, and you still want to arrange the living quarters, then it is better not to buy expensive wallpaper. For greater convenience in the process of finishing, it is better to remove all pieces of furniture from the premises, as well as to minimize all possible interference. It is also important that direct sunlight do not fall on the area covered with wallpaper, as they will prevent proper drying. To do this, you can close the windows with a thick cloth. Avoid drafts! Before starting the workflow, close all windows, turn off air conditioning, exhaust or electrical ventilation. Then clean the ceiling of the plaster with a spatula and ground it. If the apartment has joints of floor slabs, then it is important to be extremely attentive and give them special attention. As for the primer, it should be selected in accordance with the wallpaper. Typically used primers based on acrylic deep penetration. The primer should be applied in several layers, each of them must dry before the next one is applied. However, pre-fill the cracks, if any. Mark the treated ceiling with the primer so that the wallpaper is perpendicular to the one of the walls of the room. The place where there will be a chandelier, seal with masking tape. For safety reasons, it is recommended to turn off the electricity before pasting the wallpaper. 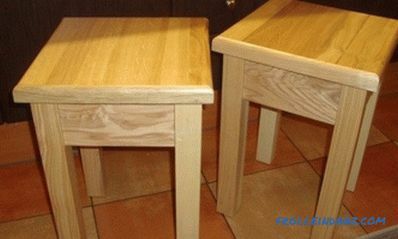 A stepladder, table or chair. 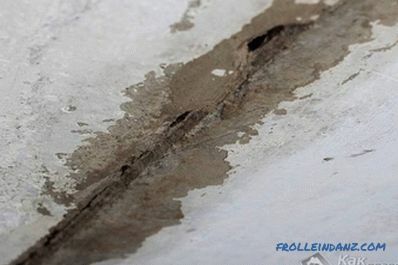 Depending on the general condition of your ceiling, you may need more and additional funds for high-quality processing of the base for sticking. It may be necessary to level, plaster or putty the surface. 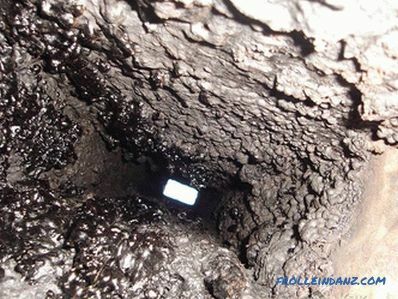 Because of this, you should carefully inspect and prepare the surface before finishing. 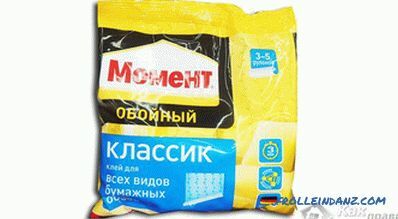 Depending on the selected material, prepare the surface properly. If you have doubts, before starting work, you can watch the video at the end of the article in order to visually get acquainted with the technological process posted in this article. Preparation for pasting should, among other things, be accompanied by a decision on how it would be better to glue the wallpaper - in width or length, most often it depends on the terrain. If you have to revet a multi-level ceiling, then it should be done in combined ways. A proven method in standard situations is to place the stripes in the direction of the sun’s rays from the windows. 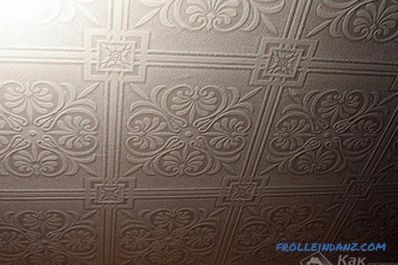 When self-pasting Wallpaper you should first mark the ceiling. Apply the lines of the edges of each stripe of wallpaper, and after each separate section, spread it with adhesive and glue the strip of wallpaper without delay. This moment is important, otherwise the wallpaper in any case will peel off and sag. To be sure, apply glue not only on the surface to be glued, but also on the strip. Cut the wide rolls with a small margin so that they can be trimmed later by cutting off the excess. 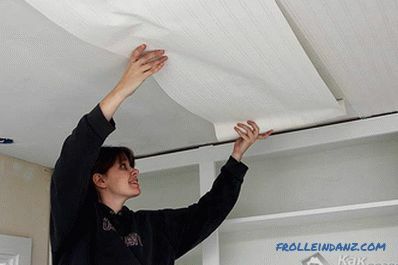 For more convenience, pre-make blanks for the entire ceiling, this will allow you to save yourself time. 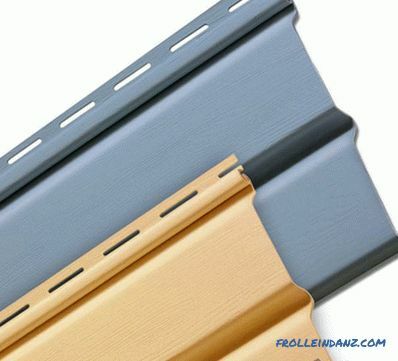 The essence of the technology is no different from the one used for wall cladding in the same way: apply glue, attach wallpaper to it, press them with a brush, and at the end trim the edges. To remove creases and bubbles, smooth out the surface evenly using clean rags. Now smear the edges with a brush and continue the process in the same way. If painting is supposed, then after pasting, apply two layers of water-based paint on them according to the instructions for use. If you do not have a helper at your disposal, please note that all actions should be carried out as quickly as possible. Do not allow the glue to dry on the wallpaper. Each strip should be glued with maximum speed. To speed up the process, use a sustainable long construction that you can stand on and / or a device to support a sheet of wallpaper from the floor. Be as careful as possible to prevent any kind of oversight. Inspect each pasted strip on all sides. If you lack the strength or experience for pasting wallpapers with your own hands, then invite an assistant, so that later there is no need to re-perform the same process. As mentioned earlier, the canvas should be glued parallel to the light rays from the window. 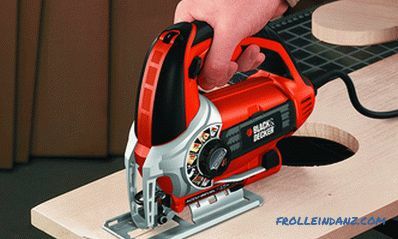 However, this method of pasting can lead to additional costs, because you will need to use more material. In order for the glue to be of the highest quality, it should be diluted half an hour before workflow. Following the recommendations of experts and maintaining proportions, you will quickly come to completion. For each type of wallpaper there is the most appropriate type of glue. In order to avoid the formation of lumps, stir the water with a stick before forming a funnel. After that, pour the dry adhesive mixture in a thin stream into the funnel. Do this continuously, without haste. Allow the adhesive to swell.